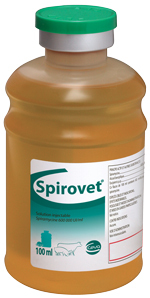 Spirovet® is presented in its specific CLAS® container, patented by CEVA Animal Health, SPIROVET® is a unique specialty that provides at the same time a quick efficiency as well as a good comfort for the pig and for the farmer. Diseases caused by spiramycin susceptible bacteria. - Interdigital necrobacillosis (foul in the foot). Do not use in animals known for their hypersensitivity to spiramycin or to any of the excipients. In cattle, do not administer more than 15 ml per injection site. In sows, do not administer more than 7 ml per injection site. Due to the likely variability (time, geographical) in the occurrence of resistance of bacteria for spiramycin, bacteriological sampling and susceptibility testing are recommended. Care should be taken when handling the product to avoid self-injection. In case of accidental self-injection, seek medical advice, and show the package leaflet. People with known hypersensitivity to spiramycin and/or to other macrolides or to the components of the formulation should avoid contact with the product. Wash hands after handling the product. In case of accidental eye exposure, wash with plenty of water. In case of accidental contact with skin, rinse immediately with water. Bodyweight should be determined as accurately as possible to avoid underdosing. For both cattle and sows when more than one injection is necessary on the same day because of the restriction of maximum dose volume, all the injections should be administered on the same side of the neck 15 cm apart. If it is necessary to repeat the injection after 24 hours all the injections should be given on the other side of the neck again 15 cm apart. This procedure is necessary so that individual injection sites are kept apart. Failure to follow these instructions may result in residues violations. 30 000 IU of spiramycin per kg bodyweight, i.e. 5 ml of product per 100 kg bodyweight. The injection may be repeated once after 24 hours. Do not administer more than 15 ml per injection site. 75 000 IU of spiramycin per kg bodyweight, i.e. 5 ml of product per 40 kg bodyweight. The injection may be repeated once after 24 hours. Do not administer more than 7 ml per injection site.